"Some of my constituents have inquired about a lawsuit that was filed this week in Stoddard County in Southeast Missouri that addresses the alleged over-stepping of the Missouri Department of Revenue (DOR) regarding concealed carry documentation. It is believed that since the first of the year, the DOR has been collecting and scanning documents of individuals who were seeking to renew their concealed carry permits. State statutes are very clear to say the DOR is not to retain or collect documents on Missouri citizens. These state statutes prohibit the state from complying with the federal Real ID Act — an act passed by Congress in 2005 in the aftermath of 9/11 that says states are to collect and store documents that can be used by federal agencies. 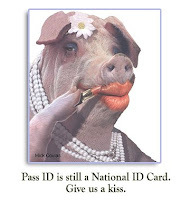 The act was to pave the way for a national ID card. Documents required for the card are a birth certificate, social security number, and proof of residence. Many believe that the Missouri Department of Revenue may have received a federal grant of between $3 and $5 million to begin putting such an ID system in place. The lawsuit alleges that the information collected may have been sent to a company in Georgia —Morpho Trust USA. According to this company's website, they specialize in the partnership of different government agencies to collect and provide individual identification information. Some are questioning if it is possible that the DOR is trying to implement the federal Real ID Act, though Missouri law strictly forbids it. This has raised concerns about individual privacy, especially for concealed carry holders who do not want their identity or their address known. I need to reaffirm that these are allegations made in a lawsuit. Hopefully, the complete story will come out in court hearings. There has been no comment on this issue from the Missouri Department of Revenue." 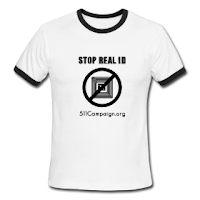 In other Missouri News, Bill Slantz campaigners say,"REPEAL THE PATRIOT ACT, REAL ID, AND THE NDAA. GROUND THE DRONES"
The National Strategy for Trusted Identities in Cyberspace is moving ahead with current plans to establish more pilots and programs this year. "Seattle police and other city agencies would have to get approval before buying surveillance equipment, under legislation the City Council is considering."